Born in Takoma Park, Maryland on September 21, 1832, Carroll was educated at local schools. Deciding to pursue a career in the United States Army, Carroll received an appointment to the United States Military Academy at West Point. Although not from Ohio, Samuel Spriggs Carroll served as colonel of the Eighth Regiment Ohio Volunteer Infantry for a portion of the American Civil War. Born in Takoma Park, Maryland on September 21, 1832, Carroll was educated at local schools. Deciding to pursue a career in the United States Army, Carroll received an appointment to the United States Military Academy at West Point. In 1856, he graduated from this institution, ranked forty-fourth out of forty-nine cadets. Upon graduating, Carroll was commissioned as a second lieutenant and primarily served at western outposts until authorities commissioned him as West Point's quartermaster. With the Civil War's outbreak, officials promoted Carroll to the rank of captain and assigned him to the Tenth Regiment of United States Infantry. In December 1861, he became the colonel of the Eighth Regiment Ohio Volunteer Infantry, assuming command of this organization at Romney, Virginia (now modern-day West Virginia). He and his command participated in most major battles in the Eastern Theater during 1862. During early 1862, he participated in the Valley Campaign, leading his men at the First Battle of Winchester. His regiment briefly joined General Irvin McDowell's force at Fredericksburg, Virginia, before transferring to James Shields's division. Carroll now commanded the Fourth Brigade, which included the Eighth Ohio, the Fourth Regiment Ohio Volunteer Infantry, the Fourteenth Regiment Indiana Volunteer Infantry, and the Seventh Regiment West Virginia Volunteer Infantry. Under Shields's command, Carroll first fought in the Luray Valley in Virginia, where he led his brigade at the Battle of Cross Keys and at the Battle of Port Republic. In this second battle, Carroll's horse was wounded, falling on his rider. Carroll's right shoulder was dislocated. This was the first of many combat injuries that Carroll received. Carroll and his brigade also participated in the Battle of Second Bull Run, the Battle of Cedar Mountain, and the Battle of Antietam. He was severely wounded in his chest while inspecting a picket line along the Rapidan River in Virginia in the autumn of 1862. 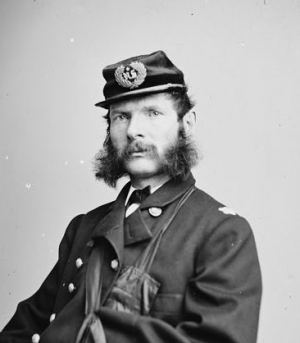 He recovered enough from his injury to rejoin his brigade, which was now part of the Third Corps of the Army of the Potomac, for the Battle of Fredericksburg in December 1862. In 1863, Carroll assumed command of the First Brigade, Third Division, Second Corps of the Army of the Potomac. This brigade still contained the Eighth Ohio. Carroll participated in the Battle of Chancellorsville and the Battle of Gettysburg, where his brigade repulsed a Confederate assault on Cemetery Ridge on July 2. During late 1863, Carroll also commanded men at the Battle of Mine Run, at the Battle of Bristoe Station, and at the Battle of Morton's Ford. In 1864, Morton assumed command of the Third Brigade, Second Division, Second Corps of the Army of the Potomac. Military officials promoted him to the rank of brigadier-general on May 12, 1864. He led his men in the Wilderness campaign of May 1864. During the campaign, Confederate soldiers wounded him three times. On May 5, Carroll was shot in his right arm. On May 10, he was wounded in his right leg, and on May 13, he was shot in his left elbow. Following this last injury, surgeons amputated Carroll's left arm. Upon recovering from his wounds Carroll briefly served as the commander of the Department of West Virginia and also led a division in the Army of the Shenandoah during the last few months of the war. Upon the war's conclusion, Carroll remained in the military, serving in the inspector general's office until he retired in 1869. By the time of his retirement, Carroll had obtained the rank of brevet major general. He returned to Takoma Park, Maryland, where he died of pneumonia on January 28, 1893.